The Institute of Quarrying Hong Kong Branch is a professional body which unites people of the industry throughout Hong Kong and PRC. It is with great sadness that the Institute of Quarrying Hong Kong Branch have reported the death of Andrew Houghton, who passed away on 29 March having battled with cancer. 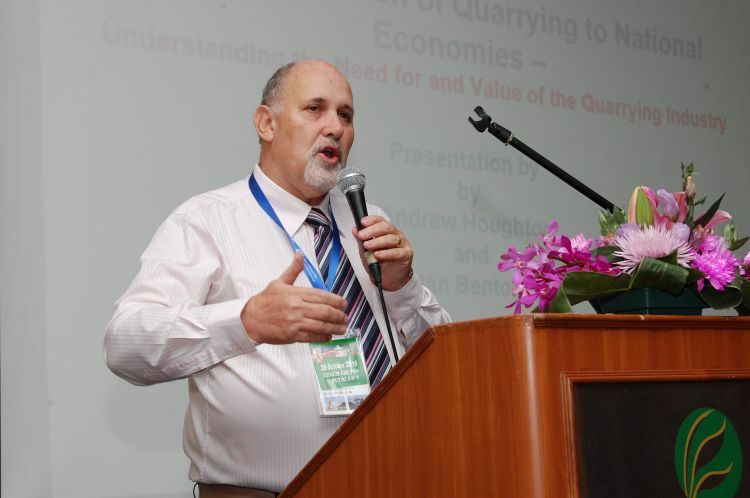 Andy Houghton was not only Chairman (1989) and a long serving Committee Member of the Hong Kong Branch, but also a founding member of the Institute of Quarrying in Malaysia (IQM). Andy, was a qualified professional Engineering Geologist and had been involved with the quarrying industry for over 40 years. In mainly consulting roles, specialising in large tunnelling and cavern geotechnical engineering he worked on a variety of major projects across the quarrying and mining industry in Asia, Australia and the UK. As a passionate supporter of the IOQ, Andy published many technical papers throughout his career and was a much respected speaker at quarrying conferences, symposiums, and delivered wide-ranging training courses ensuring professional development among quarry practitioners, including training modules on Quarry Planning and Development, for the IQM, as part of their Quarry Managers Training and Certification Program. As well as being very successful in his career, Andy used his talent to help others and, to that end, devoted much of his spare time as a lay preacher, undertaking charitable and pastoral works. A much valued and well-liked member of the Hong Kong Branch, Andy will be sorely missed. 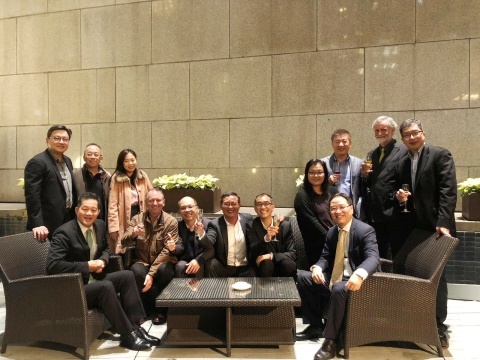 The 46th Gala Dinner of the IOQ Hong Kong Branch was again held at the Kowloon Shangri-La Hotel, Tsim Sha Tsui, on Saturday 1st December 2018. The evening was extremely well attended with over 380 guests, including honored VIP’s, IQ Members, partners and guests. Mr. Alfred Chan, Branch Chairman, gave the welcoming address to our guests and local members, and also thanked the many sponsors for their generosity, without which the evening would not have been such a great success. Commenting on what had been another successful year for the Branch, Mr. Chan urged all present to encourage new members to join, outlining the many benefits of Branch Membership. 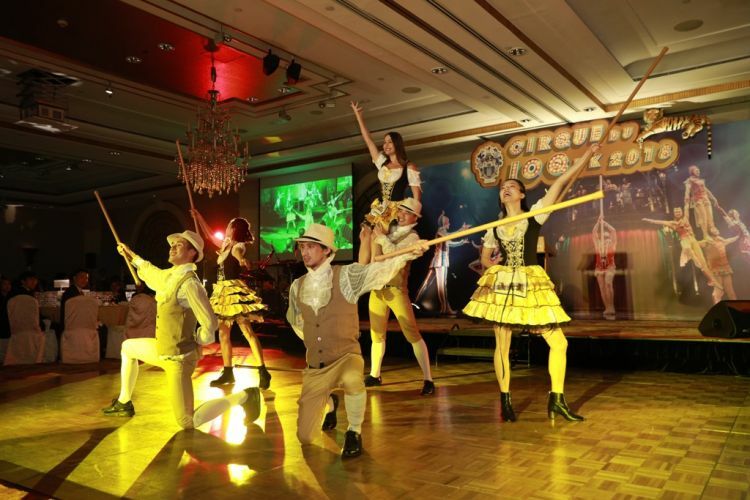 In keeping with popular tradition our themed evening this year was “Cirque Du IOQHK”, which provided for much creativity and entertainment. Guests were welcomed by a red carpet ‘Balloon Arch’ cocktail reception, which offered a great venue for networking with business partners, colleagues, and old friends, photo taking opportunities, and game booths. 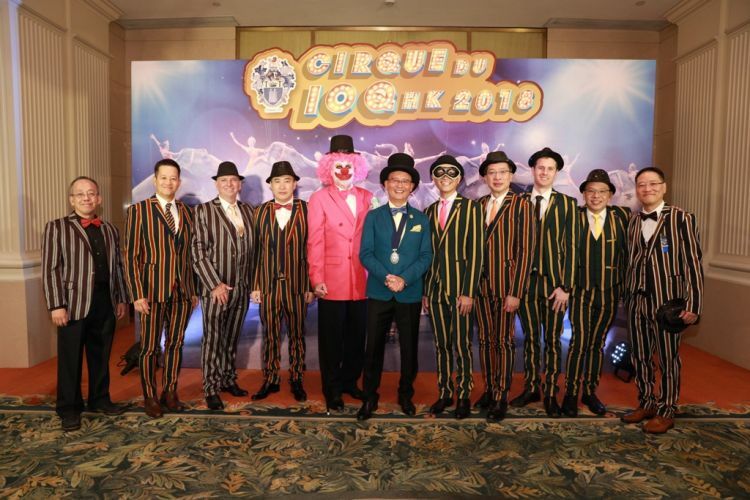 The circus theme was extremely well received, providing guests with a visual performing art as Council Members wore “Cirque Du IOQHK” dress code; acting in different characters with colorful props and decorations. The evening continued with a sumptuous meal accompanied by our very lively host, Mr. Harry Wong, who entertained our guests with mind-blowing magic and illusions. Music was provided by a seven-piece live band, professional dancers, table games and of course, our now famous tombola, concluding the evening with a MacBook Pro 13" first prize! With wonderful entertainment, fantastic company, and tremendous Branch support, the evening will be remembered for a long time as one of the best hosted by our Branch. Your committee members will look forward to the challenge of making our 2019 Gala Dinner even more enjoyable. The 2018 IOQ New Zealand conference, together with the IOQ International Presidents meeting this year was held in the week of 16th July in the beautiful city of Hamilton New Zealand. 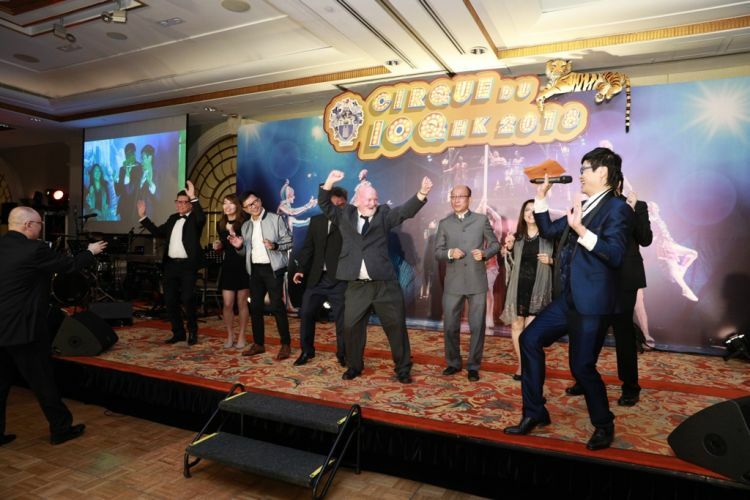 Our Chairman - Mr. Alfred Chan attended this function on behalf of IOQ Hong Kong, which a tradition of the IOQ International routine. This year the theme for the IOQ New Zealand Conference is “50 Years and Beyond - Embracing Future Technology in our industry”. Numerous professional papers were delivered by the industry experts during the conference, and besides, functions were being held to celebrate the 50 years anniversary of IOQ in New Zealand. Our Chairman attended the International Presidents Panel Discussion section and addressed an update on the future development of the quarrying industry in Hong Kong, and in particular the importance of our bridging function on the Guangdong quarrying opportunities. 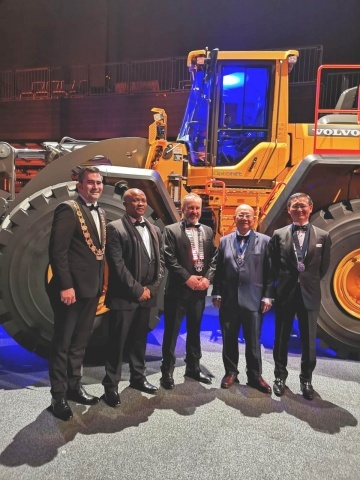 The function ended with an amazing Gala dinner held in the Claudelands Convention Centre attended by almost 400 delegates. Enclosed is a photo of the International Presidents with a background of a latest model of mobile equipment of an exhibitor. The International Conference and IOQ Presidents meeting next year will be held in Durban, South Africa in April 2019. 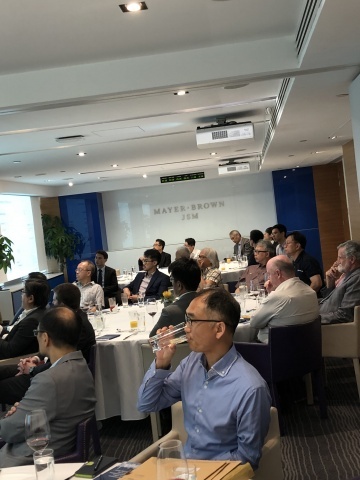 The Branch was delighted to host a lunch presentation on the 22nd June; with a presentation by Ir Clayton Chan, Executive Director, Geotechnical of AECOM Hong Kong, on the Challenges and Opportunities of New Quarries in Hong Kong. AECOM is a multinational consulting firm which not only design, build, finance and operate infrastructure assets across the world, but have many decades of experience working in Hong Kong, including studying the future of the territories quarries. In his presentation, Ir Chan outlined the locations of the sites currently under consideration by the government, including the challenges and opportunities presented for each. Members found the presentation to be extremely interesting and informative, which stimulated a lot of questions from the audience. Mr. Alfred Chan, Chairman of the HK Branch, gave a vote of thanks to Ir Chan, and presented him a token of appreciation. 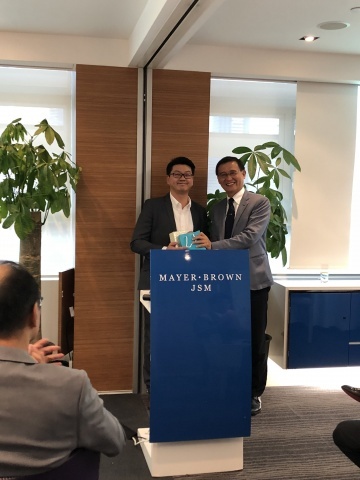 Following the talk, Branch members and guests then enjoyed a sumptuous buffet lunch, with a special note of thanks to Mr. Geoffrey Chan, partner of Mayer Brown JSM, who arranged the menu and contributed the excellent venue. Further to our announcement for the launching of the e-membership, we are pleased to introduce the Shell Value Card exclusively for you as the members of IOQ to get more benefits. You can get instant discount on gasoline of HK$ 2.2/L at any Shell stations in Hong Kong (except airport stations) and other benefits when you show your "IOQ Shell Value Card". 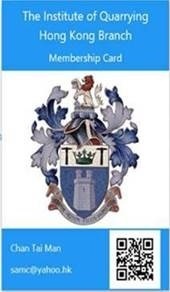 If you have not registered yourself for the e-membership card yet, please check your e-mail inbox (or junk / spam) for the link for activating your membership card. 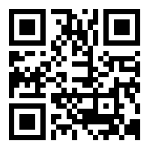 If you cannot find the mail, just go to the membership page and click “Forget Password?” and the system will send a new activation link to registered e-mail address. The first IOQ Branch Committee meeting for 2018, was held on the 19th January, at The Sports Club, South China Building, Central. 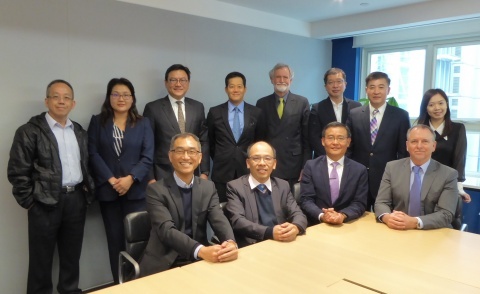 Following the meeting, IOQ Hong Kong Branch Chairman, Mr. Alfred Chan, hosted committee members to a celebration dinner, and thanked the committee for a very successful 2017. Committee Members can be seen raising a toast to all our Branch Members, whishing everyone joy, peace and prosperity, for the coming year of the Dog. On the 12th January 2018, the IOQ Branch held its first technical lunch presentation at the Regal Kowloon Hotel, entitled; New Technology in the Quarry Industry and Future Quarry – Multi Action Crusher & VisioRockTM, which was presented by Mr. Campbell Johnston, Director, Sales and Support Systems from Metso. Mr. Johnston delivered a very informative presentation on future challenges facing the quarrying industry and their new revolutionary MXTM cone crusher which combines the piston and rotating bowl into a single machine, providing significant improvements in profitability by cutting operational costs. Mr. Johnston also described the Metso VisioRockTM system, which though photogrammetry analysis enables instant assessment of particle size distribution on a product belt, allowing ‘real time’ crusher adjustment to optimise product yield. 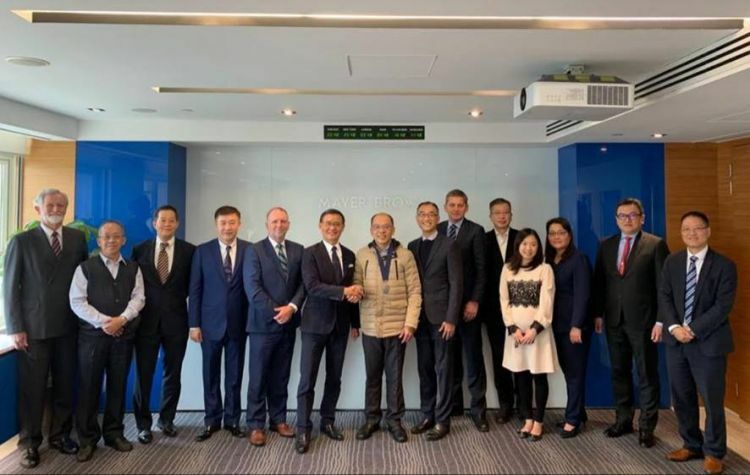 The Branch was also delighted to welcome, Mr. Markku Simula, President, Aggregates Equipment, Metso Minerals Inc., and Mr. Xiaofeng Liang, SVP, Metso (China). Following a lively Q&A session, Branch Chairman, Mr. Alfred Chan, proposed a vote of thanks and presented Mr. Johnston with an IOQ souvenir. The event was very well attended with 34 members and guests, enjoying the presentation and following three-course lunch. 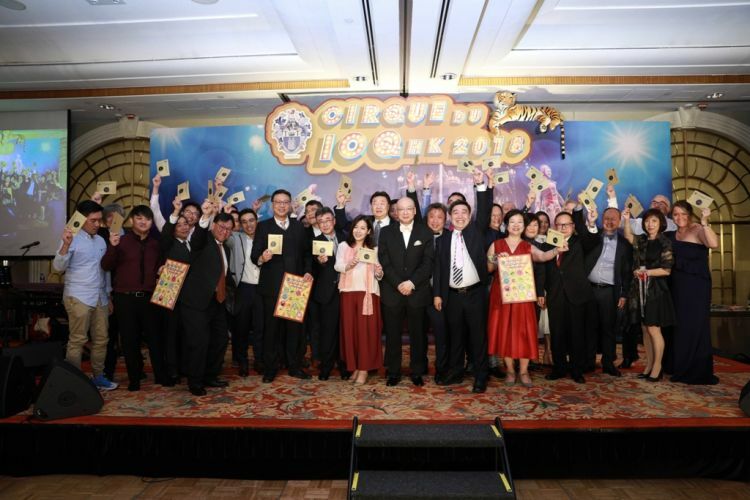 The 47th IOQ Anniversary Gala Dinner, will be held on the 30 November 2019, at the Kowloon Shangri-La. The 46th IOQ Anniversary Gala Dinner, will be held on the 1st December 2018, at the Kowloon Shangri-La.